Yesterday we blogged about a simple eye test that could screen for mild traumatic brain injury. This would aid doctors in the diagnosis of a mild traumatic brain injury, which often goes under diagnosed. It’s a simple ten minute eye test that would tell doctors whether or not the person suffered a brain injury. Today we will delve into a deeper analysis of this study. Papillary deficit is one of the problems one may see with mild traumatic brain injury. Researchers tested for this by measuring the light reflex of the pupil. This is measured by looking at the average velocity at which the pupil gets smaller, the average velocity at which it gets bigger, and the average time the pupil recovers from a light stimulus. When light hits the eye, the pupil constricts or gets smaller. All three of these measures I mentioned are significantly different in those with mild traumatic brain injury. Visual processing deals with how images are interpreted by the brain. A delay in this function could be a symptom of mild traumatic brain injury. This can be tested using the 15-item Convergence Insufficiency Survey, an overview test of vision. It asks questions such as do you lose concentration when reading or doing close work. More symptoms on this exam were significantly present in those with mild traumatic brain injury. Oculomotor tracking and oculomotor reading dysfunctions are additional problems one may face with a mild traumatic brain injury. This issue deals with the motion of the eye. The King-Devick Test tests for impairments in the motion of the eye while reading. Patients with a mild traumatic brain injury take a longer time to complete the test, which might include reading aloud a series of numbers from left to right, line by line. The researchers also used the Snellen eye chart to test for near point convergence. One symptom of traumatic brain injury can be blurred vision or double vision. The Snellen chart is the familiar “big E” chart used in most eye exams. Near point convergence can be tested by measuring visual acuity at a distance, close up, and as an object moves closer to the eye. The researchers used a single letter probably on a metal rod to test for convergence, or coming together. Near point convergence was higher among subjects with mild traumatic brain injury. The higher score indicates that near-point convergence, or the point at which the letter became blurry or doubled, was further away. 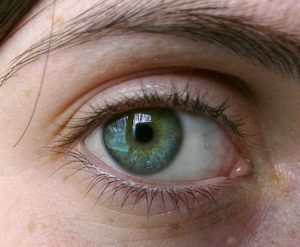 One of the problems that the researchers were looking for was binocular eye movements. This is also called versions. This was tested for in the King-Devick Test, when the subject has to read numbers left to right, line by line. Binocular problems could be associated with headaches, blurred vision and double vision, to name a few symptoms. Versions are eye movements in the same direction. The other problem researchers were looking for were disconjugate movements, or vergences. Vergences are the eyes moving in opposite directions. This could be tested for using the near-point convergence test, when a single letter is moved closer to the eyes to measure convergence. Visual problems are symptoms of mild traumatic brain injury. Much of the brain is devoted to vision. A blow to the head could make for a host of visual problems. This line of testing could hopefully make it easier for doctors to diagnose a mild traumatic brain injury, which can often go undiagnosed.